I gambled this time and did not order all of the preorder items but instead figured I could trade for them. But with my early exit Saturday I didn’t pick up any of that stuff. Looks like I need to put together a needs list and hunt a few things down. I took a panoramic picture Friday night of the patch trading. It wasn’t as dark in the tent as this picture let’s on. 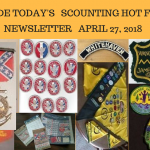 The wonderful thing about patch trading at Dixie is that they usually erect a dining tent and that’s where patch trading happens so everyone has plenty of room to set up. I know there was also a conclave going on this weekend in VA and probably somewhere else. The weather was ideal getting in the 70s. 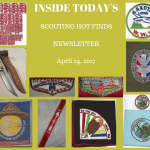 I am already looking forward to the next chance to do some patch trading which will not be until NOAC in late July. 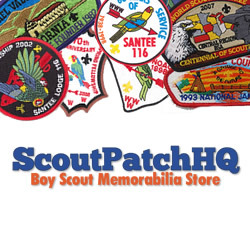 Earlier in the week I posted over 1700+ new items in my ScoutPatchHQ.com store. 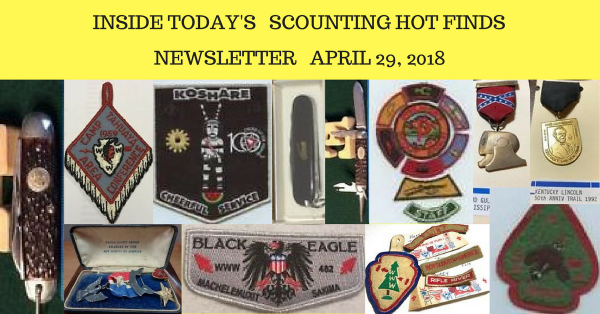 These focus on OA lodges from #265 – #617 and include 12 Jensen black boxes full of patches.